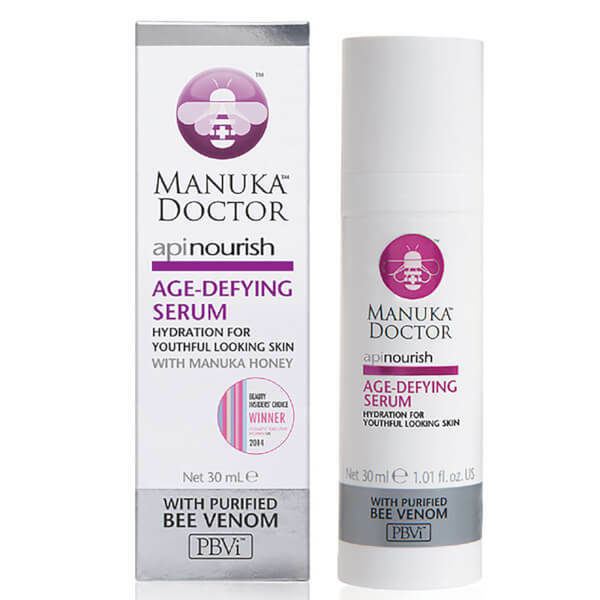 Rejuvenate mature skin with the ApiNourish Age Defying Serum from Manuka Doctor, a super-hydrating formula that helps to achieve gorgeously smooth and younger looking skin. Designed for tired, dull skin in need of a boost, the serum deeply penetrates with Purified Bee Venom™, royal jelly and manuka honey to seal in moisture and help nurture collagen production and elasticity. Bursting with essential oils and vitamins, the anti-ageing treatment works to smooth the appearance of fine lines and wrinkles and leave your complexion with a radiant healthy glow. Aqua (Water), Propylene Glycol, Dimethicone, Mel (Honey), Cyclopentasiloxane, Polysilicone 11, Glyceryl Stearate, PEG-100 Stearate, Polyacrylamide, Caprylic/Capric Triglyceride, HDI/Trimethylol Hexyllactone Crosspolymer, Phenoxyethanol, C13-14 Isoparaffin, Cetyl Alcohol, Tapioca Starch Polymethylsilsequioxane, Parfum (Fragrance), Propolis Extract, Sodium Hydroxymethylglycinate, Xanthan Gum, Laureth-7, Sodium Hyaluronate, Disodium EDTA, Ethylhexylglycerin, Olea Europaea (Olive) Fruit Oil, Ribes Nigrum (Blackcurrant) Seed Oil, Royal Jelly, Sodium Hydroxide, Tocopherol Acetate, Rosa Canina (Rosehip) Fruit Oil, Butylphenyl Methyl Propional, Silica, Linalool, Limonene, Alpha-Isomethyl Ionone, Bee Venom, Hydroxyisohexyl 3-Cyclohexene Carboxaldehyde, Sodium Benzoate.